Fiction – hardcover; Bancroft Press; 308 pages; 2008. Review copy courtesy of the publisher. 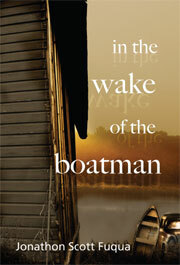 The tension between fathers and sons is a much-explored theme in literary fiction, but few present such a tangled, complicated, emotionally crippled relationship as the one depicted in Jonathon Scott Fuqua’s In The Wake of the Boatman. From the very first page it’s clear that the relationship between Carl Hatcher Steward and his son, Puttnam Douglas, is going to be a lifelong problematic one. It’s 1942, the USA is in the throes of a world war, and Puttnam has just been born. Days later Helen and the newborn finally arrived home, yet Carl’s anxieties did not abate. Alone in the gray living room of their clapboard rental, their four-year-old daughter asleep in bed, Carl’s thoughts crudely took him off guard. On this oppressive Norfolk evening, the notion came to him so calmly it almost made sense. He should crack his little boy’s neck as gently as possible. It would be like saving two lives. This is an important glimpse inside Carl’s dark heart. He’s a damaged man who seems unable to love his son. Why? Because he’s ashamed that he has brought a child into the world at a time when “another mouth to feed would not help the war effort” and humiliated because his dodgy knee means he cannot join the Army. By the time VE Day arrives, three years later, Carl’s hardness has not thawed: he finds himself in tears because it suddenly dawns on him that he does not know how to give his son a hug. It seemed a completely different act from hugging his wife or daughter. He had gone over to his son with intentions of hugging him, but in the end, hadn’t been able to. Suddenly he felt old, worn, and permanently immovable. He was in a groove too deep to change. ‘Jesus,’ he cried softly to himself. He grasped his nose with his fingers and held his breath. Putt glowered at his father. ‘You think it’s just me? That I’m not allowing you to understand me?’ He laughed. ‘It’s not me,’ Carl said, looking ahead at the road, at the hills that were growing longer. Any wonder, then, that Putt cuts all ties with his father? Their estrangement serves to fuel Putt’s desire to be successful, and he graduates, becomes an infantryman in the United States Army and later a decorated hero in the Vietnam War. All the while he keeps in touch with his older sister, Mary, a strikingly beautiful woman who marries a man with more than a passing resemblance to Carl, and his affectionate if slightly scatty mother (interestingly, she calls him “Mama’s boy”). On the surface Putt is a strong, attractive man, but underneath he’s scrabbling to come to terms with a homosexual dalliance in college and a penchant for cross-dressing. These two secrets, if exposed, will destroy him and so, the anxiety, the disgust and the shame of it, build and build. It is only when his aged father falls ill that he must face the truth about himself, whatever the consequences. If this sounds like a dark, complicated tale, then you’d be right. But there’s something quite beautiful and devastating about this book, which never resorts to melodrama to convey the tortured, ambiguous nature of Carl and Putt’s relationship, nor Putt’s confused sexuality. The story is told in the third person — mainly from Putt’s point-of-view — and moves so quickly that time seems distorted. You can turn a page and suddenly find the narrative has moved ahead by years without any real explanation of what’s happened in between. But this is not a quibble. I like Scott Fuqua’s tendency to let Putt’s secrets remain just that. While we come to learn that Putt is confused by his sexuality and ashamed of his desire to wear women’s clothes behind closed doors, these are not laboured and remain hazy, sketchy events, which make them all the more mysterious and intriguing. By contrast, the formative event in his young life — when he accidentally puts a boy’s eye out with a rock at a local swimming pool when he was just six years old — is mentioned many times, I think because it symbolises Putt’s confused feelings over his masculinity: he’s proud of this one act that proves he can stand up for himself, and yet he’s also ashamed of the violence of it. In the Wake of the Boatman — the title refers to Carl, the backyard boatman, who builds his own craft that sink upon launch — is the kind of book I did not expect to like. But I found it totally absorbing, incredibly realistic and emotionally hard-hitting. I read it more than six weeks ago and I’m still thinking about it, which may partly explain why this review has been such a long time coming. As an aside, I have to say the names of the characters in this book are amongst some of the weirdest I’ve ever come across. If Puttnam wasn’t unusual enough, how about these: Milton Pilterpuss, Bertrand Capote, Percy Dishbrower and Thane Forgit. They almost sound computer-generated.